Edward Green WeymouthThose that feel bound to wear black lace-ups during the week all too often react with scruffy old trainers at the week end. They say they’re more comfortable. They say it helps them relax. In my experience, it is more likely to make them look like a child. There are lots of great trainers out there, Converse and Common Projects being among my favourites, so I certainly don’t dismiss them entirely. But these are worn for style, with none of the excuses listed above. Men with little to no knowledge of what makes a good or stylish trainer should look to something else instead: suede. 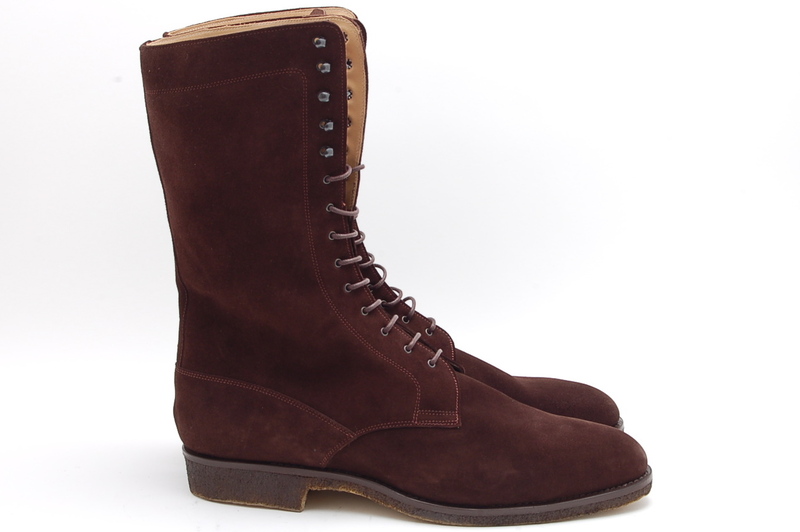 Rivolta made-to-order bootsBrown suede shoes are wonderfully comfortable. A nice clean pair of suede Oxfords with jeans or chinos retains a frisson of style yet doesn’t try too hard; too hard, that is, for a newspaper with kids under your feet. Desert boots are popular with the workwear crowd for just this reason. Plus their lack of structure makes them even more comfortable. If brown is too boring, try a light gingery suede like my Rivolta boots or an unusual purple or orange. Just don’t wear suede gomminos out around town. Alfred Sargent BrowningSome men, many of them style icons, wear nothing but suede shoes. For them, it is a consistent softening of whatever is worn above the ankles. No matter what the class of the tailoring elsewhere, the suede shoes reassure you that this is no businessman, no banker. This is a man who is happy to treat every day like the weekend. You can follow the discussion on Suede shoes at the weekend by entering your email address in the box below. You will then receive an email every time a new comment is added. These will also contain a link to a page where you can stop the alerts, and remove all of your related data from the site. Totally agree. Weekend is reserved for suede Alden boots and EG loafers. I would also add Supergas to the list of trainers. Very comfortable and look great with chinos. See previous Tod’s piece. They will never last as long and have the chance to age if they are worn outside like normal shoes. Tod’s Gomminos may not last too long if you wear them out of the house but they look fantastic for as long as they do! I live in Hong Kong and I have been follower of your blog for years, which have enlightened me a lot on dressing up. My comments here may seem a bit side-tracked. I wear English shoes for many years, maninly Church’s since their pre-Parda days and a few pairs of Crockett & Jones, and I like my suede Chetwynd from Church’s very much. I noticed that you seldom, if not never, comment on or recommend Church’s shoes. Are there any reasons that you stay away from Church’s, is it because that it has been acquired by Prada so it is no longer English shoes, or you reckon it not on the same league as C&J or Edward Green? No, Church’s are good but I have never owned any myself so can make no personal recommendation. They are certainly not up there with Edward Green, but that is reflected in the price. I love Crockett & Jones and am told by many that they are better value for money than Church’s, but I can’t state that for myself. 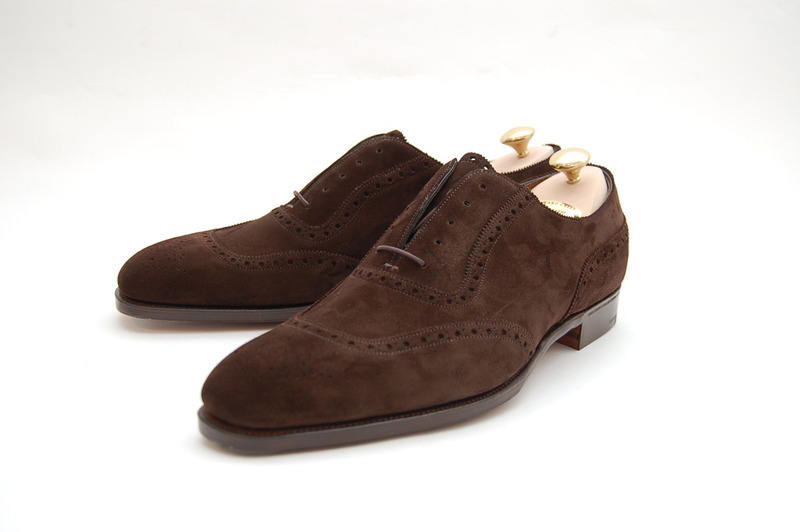 I have been trying for 3 years to find some narrow fitting suede shoes in any style in the UK but without success. I am not aiming to pay more than about £350 but all ready-to-wear shoes (especially suede / buckskin) now seem to come in D or even wider fittings. Why is this? (I cannot believe that I am the only person in England to take a 10 1/2 B in an Oxford or Brogue. Crockett & Jones have come closest to a decent fit. I used to buy Church’s exports (produced for Brooks Brothers, USA) in narrow fittings – even A – but these seem to have disappeared. Any suggestions? 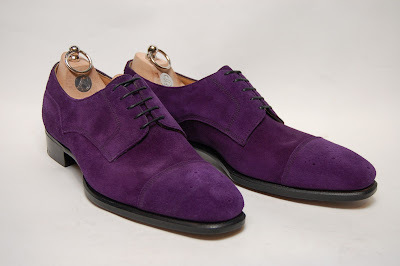 Simon – when you acquire a new pair of suede shoes do you treat them with a protectorate of some kind and if so, do you do this yourself or have it done by a cobbler? Hi. Yes, and I do it myself. Just a quick spray with a Saphir protector, and re-do it once or twice a year. Thanks. Is it their Super Invulner product that you use?